Guilford, Conn.: The Lyons Press, 2005. 248 pp. $23.95. In her mid-40s, a successful executive just placed in charge of Xerox's Color Solutions Business Unit, Quin had a taste for exotic travel that took her in late 1998 to Yemen with a group of 18 other Western tourists. She and they had the misfortune to have their Land Cruisers driven directly into a war between the government and an Islamist outfit called the Aden Abyan Islamic Army. The entire tourist group was taken hostage on Dec. 28 and held for over a day before Yemeni military forces attacked the AAIA, leading to the deaths of four tourists, two terrorists, and one soldier. Quin herself had a close brush with death but the terrorist holding the gun in her back was hit before he could do damage to her; in an act of daring-do, she managed to pull from his still-live hands his AK-47, an act which left her a changed person (the mild-mannered liberal feminist admits, that as she exultantly fought for the gun, she had a revelation: "so this is why men like war"). The story of the capture takes up but the first quarter of Kidnapped in Yemen; the remainder consists of Quin's personal account, mixed with her sleuthing to figure out what had happened to her and her companions. Through assiduous press research plus personal investigations that took her to London's Finsbury Park mosque (to meet the notorious Abu Hamza al-Masri) as well as a journey back to Yemen and the scene of the crime, she comes up with a coherent account of the tensions that culminated in her seizure. 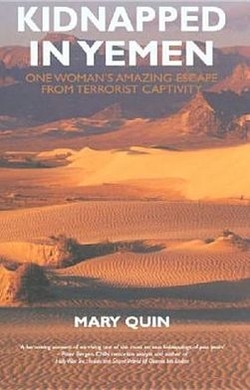 In addition to making available the story of an important terrorist incident, once which foreshadowed the current problem of Western Muslims traveling to Iraq to engage in violence, Quin provides a fine account of her own growth, indeed transformation, as a result of her brief but searing experience as a hostage. Oct. 9, 2012 update: The wheels of justice turn slowly but they do turn. After seven years' of efforts to extradite him from Great Britain, Abu Hamza al-Masri (real name: Mustafa Kamel Mustafa) was flown to the United States and today made his first appearance in an American courtroom, accused of (among other charges) participating in above hostage-taking episode. May. 8, 2014 update: Mary Quin testified at Abu Hamza's trial today. A trial artist's rendition of Quin facing off against Abu Hamza. 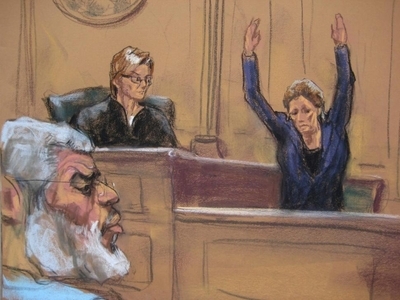 May 19, 2014 update: A New York jury unanimously found Abu Hamza guilty of eleven terrorism charges today in connection with the 1998 Yemeni kidnapping and faces life in prison.